As any gamer knows, it isn’t that difficult to become completely immersed in a great game. Japanese game designer Keita Takahashi takes the immersion concept to its logical next step with a 360 degree room-sized version of Ms. Pac-Man. It was built specifically for the 2012 BabyCastles Summit in New York. Players can step into the room and experience the bizarre disorientation of being completely surrounded by the game on all sides. The unusual setting brings together the physical and digital worlds in a way that isn’t quite as cheesy as virtual reality but is heavier on the immersion scale than, say, a TV screen. 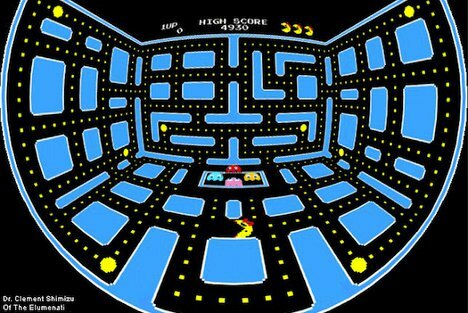 As demonstrated in the above video, the directional controls change when Ms. Pac-Man moves between walls and ceiling and floor, making the whole prospect a little daunting – but still pretty freaking awesome.